Kingdom of Chaos: Grossness- cuz I'm wimpy like that. Grossness- cuz I'm wimpy like that. Drool Prince spent some time over the weekend at Cowie's house.. During the course of their time together, there was a visit w/a friend of a friend & their 'pet'.. I use the word pet very loosely because I'm not quite sure what would possess a person to have such a pet but apparently they have mental health issues. I'm just sayin..
Uhmm, you may not know this but.. Momma Chaos does NOT do snakes.. Not even cartoon snakes.. They give me the willies.. My heart pounds, panic attacks start.. Snakes are EEWW GROSS! 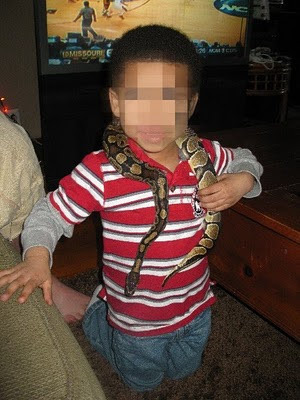 The kids take great joy in watching a nature show & if a snake comes on they'll be all "Mom, hurry come look at this! It's sooo cute!" Then I'll look, freak out & they'll laugh.. They're mean like that. My snake phobia is inherited.. My mom hates them, my Gma was way worse than me.. I remember being that kid telling her to come look at a picture in my book just to freak her out always being nice and respecting her fear.